Hello Friends, My neighbor asked me to make a Anniversary card for her and I was happy to obliged. It just so happened that I realized Just Add Ink had a Glimmer challenge going right now, so a win win for me! The card came together nicely, don’t you think? The dp behind the piece of vellum is actually in a Winter pack of paper from Stampin Up, but hubby didn’t think it looked like winter at all….thank goodness. I just love the SU silver heart vellum paper and the silver sparkly paper too, I even forgot I had the vellum. I think one needs to look through her paper more often to see what one has! LOL The Hearts were made with a SU punch. The numbers are cut out from a Sizzix die. Categories: Cards | Tags: anniversary, Card making, Cards, love, rubber stamps, Silver anniversary, stamping, Stamping Up | Permalink. What a stunning silver anniversary card. I love your layout and all the glittery and metallic awesomeness! Beautiful anniversary card. Love the silver and vellum. Perfect for the glimmer challenge. Nancy, this is gorgeous. I love, love all the glitter and that vellum is perfect. Love when cards just come together and turn out spectacular. Sorry Ive not been by much…. I’ve been super busy, but I promise to peek in from time to time. Such a lovely sparkly way to celebrate a milestone, love the layers and details Nancy. Thanks for joining us at Just Add Ink. Well, this definitely has the ‘Glimmer’ factor all over it!! 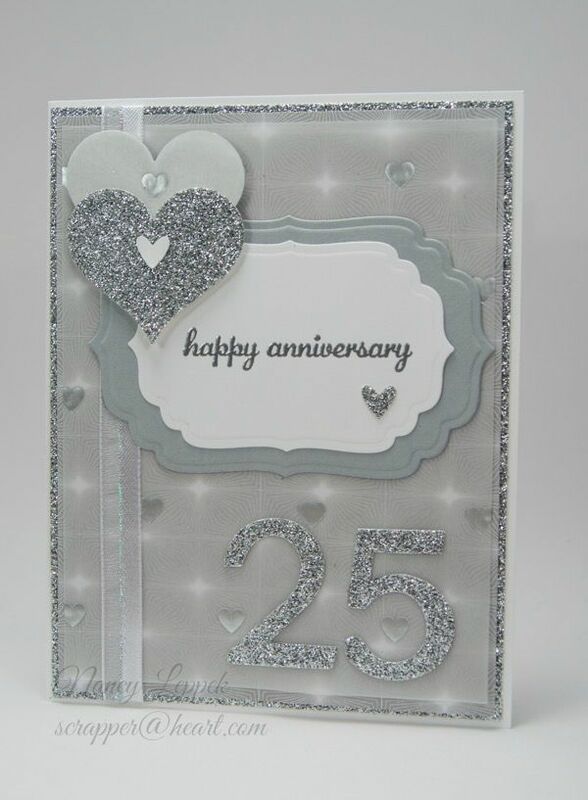 Gorgeous card and love that it has a monotone colour palette too, makes it very stylish. I love all that silver glitter paper and the dies used under the sentiment are beautiful. So very happy you joined us at Just Add Ink this week! What a wonderful anniversary card! Love all of the sparkle!